Grand Canyon University’s report card for its second year in NCAA Division I athletics added two more A-plus grades Saturday afternoon. The extra credit points have just begun to roll in. First, the GCU baseball team won at Sacramento State to clinch the Western Athletic Conference regular-season championship. Not long after, the lacrosse team defeated Colorado to earn the Men’s Collegiate Lacrosse Association national title. The men’s and women’s track and field teams also had strong finishes, both taking second in the WAC championships. “It’s great for the programs and the University. It gets GCU’s name out there,” said Mike Vaught, GCU’s vice president of athletics. “That’s one of our goals — national brand recognition for Grand Canyon University. Because of the four-year probation period required by the NCAA for universities transitioning from Division II to Division I, GCU won’t be eligible for any NCAA tournaments until the 2017-18 school year. GCU was able to play on a national level in lacrosse because it is in the MCLA, an organization for 213 programs in the United States and Canada that play lacrosse as a club sport. The baseball and lacrosse teams both had strong support at their California sites. Vaught was at the three-game baseball series in Sacramento and said the purple atmosphere was further enhanced by the presence of alumni and online students who were invited to attend, increasing the GCU crowd to nearly 100. But Vaught emphasized that the spotlight should be on the athletes and coaches. 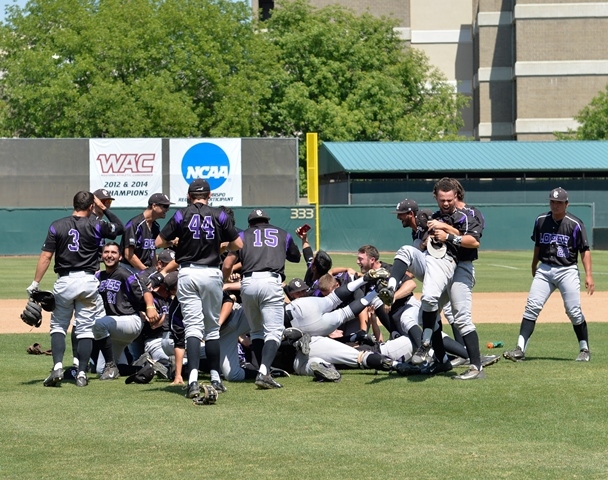 Earlier this year, members of the GCU baseball team anticipated being in a situation where their final regular-season series at Sacramento State could put them in a position to seize their first WAC title. They were right. The three-game set at the defending conference champs turned out to be a thriller. After GCU lost 5-2 on Thursday, its first-place WAC lead dwindled to a half-game over Seattle, which won that day. That meant GCU needed to win the final two games of the series to control its own destiny. On Friday, the Lopes earned a dramatic 4-2 victory in 11 innings, but Seattle also won to keep pace. That meant GCU had to win again Saturday to be assured of the championship, and the Lopes came through with a hard-fought 6-3 decision that ended in a dogpile on the pitcher’s mound. After the game, seniors addressed their teammates and spoke from their hearts about how the challenging season prepared them for their futures, both in and out of baseball. Coach Andy Stankiewicz said the team accomplished its goal of winning the conference regular-season title — GCU is ineligible for postseason play, including the WAC tournament, because of its transition into NCAA Division I. But even though his players will not be able to play in the conference tournament, which begins Wednesday at Hohokam Stadium in Mesa, the “line has been drawn” as far as what the program is capable of achieving in 2016 and beyond. In Friday’s game, the Lopes were down 2-0 early but rallied to tie the game and push it into extra innings. Third baseman Ben Mauseth hit his first college home run in the top of the 11th to send the team into a frenzy, which only intensified as Sac State went down 1-2-3 in the bottom half of the inning. Three innings earlier, Mauseth had made a key diving stop to prevent Sac State’s leadoff batter from reaching base to start the bottom of the eighth. On Saturday, with GCU holding a one-run lead heading into the eighth inning, Mauseth homered again to give the Lopes a 6-3 lead they would not relinquish, thanks largely to seven scoreless innings by the GCU bullpen. Senior pitcher Coley Bruns said Mauseth’s highlight-reel stop on Saturday seemed to energize the Lopes. The GCU men’s lacrosse team’s national championship victory, 9-8 over the reigning MCLA champion Colorado Buffaloes, was a fitting end to an impressive season in the Lopes’ fourth year in the MCLA. The Lopes were ranked fourth in the country entering the season and were considered a championship contender, but they gained even more recognition after unseating then top-ranked Colorado 18-15 on March 21 at Boulder, Colo., and stealing the No. 1 position. In 2014, GCU had lost a heartbreaker to UNLV in the first round of the Southwestern Lacrosse Conference tournament following a 10-3 season. Before the 2015 season, head coach Manny Rapkin assembled a high-powered offense that included Carson Barton, Dean Fairall, Drew Dziadyk and Tyler Ekeroth, among others. GCU had one of the best offenses in the country all season, outscoring opponents by nine goals a game and limiting some of the nation’s top offenses to a mere seven per contest (GCU played regular-season games against Arizona State, Colorado, Colorado State, San Diego State, BYU and Michigan State, all of whom made the national tournament). Rapkin said the team’s home loss to BYU in the second game of the season was a turning point for the team. GCU rallied to win 15 straight games after the loss, including the conference and national tournaments. He credits the players for coming together to accomplish a combined goal. “Our success is all about recruiting not just good players but good people and teaching them how to play the game together,” Rapkin said. “It’s a reflection of how many opportunities and disappointments we’ve had over the past four years, and it’s all come together. For the players, the season was defined by brotherhood and faith. The team prayed before each game, and players stepped up throughout the championship run to score timely goals. Barton and Fairall led the nation in scoring nearly all season and were targeted by opposing defenses during the national tournament. GCU’s offensive depth showed brightest during the postseason with 10 different Lopes scoring goals, including multiple games in which players scored five goals (Barton once and Dziadyk twice). The Lopes outscored opponents by an average of five goals per game during the postseason. Ekeroth, a senior transfer from NCAA Division I lacrosse powerhouse Denver University, was a go-to on offense throughout the playoffs, scoring in three of four games. Moving from an NCAA team to an MCLA team (considered club status) wasn’t an issue for Ekeroth, who said his teammates were some of the best players he’s played with and against. Six GCU players were named to the MCLA All-Tournament Team, and nine Lopes earned All-American honors (Barton, Fairall and Kris Holland all were named first team). GCU will bring in a class of nearly 20 new players for the 2015-16 season. Michael Ferraresi, Cooper Nelson and Rick Vacek contributed to this report.